Rock-solid reliability meets advanced technology, now that the acclaimed Propulsion™ Line Management System has become standard even on the modestly-priced Spirex. One of Shimano’s best-selling S Concept reels, it’s the hands-down favorite for walleye and smallmouth anglers who need a trouble-free reel with a dependable drag. Now smoother and longer-casting than ever! Features a graphite frame, sideplate and rotor; cold-forged aluminum spool; Varispeed Oscillation; Fluidrive II, Quick Fire II one-hand casting system; Dyna-Balance; and a ported handle shank. Now with 6 shielded stainless steel ball bearings for smooth performance all around. "I recently went on a trip to the Upper Susquehanna in Pa and was really excited to try out the Spirex RG. I typically use a number of setups during the trip and recently added this reel to my arsenal. I took the time to research the gear and read all the reviews before buying it. "i got the biggest one made and it is a powerhouse. i use it for catfishing and it is a great reel. for the money it would be hard to find a better quality reel." "I Have fished freshwater and salt water and I have never had any reel as durable and as smooth as the 1000,2000, and 4000 series. If they made a fly reel I would buy it in a second. I think the rear drag system is the best. I have fished with these reels for over 14 years and they have never failed me." 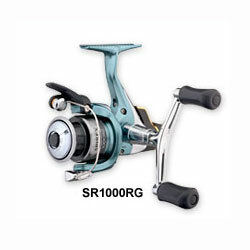 "I bought this reel with great uncertainy due to the great price. But wow i got all the bang for my buck. this reel went atop a 7ft carrot stick and is used for long cast and working carolina riggs. The spirex 4000rg is my favorite weapon for catching those durn elusive bass in shallow to 15ft of water. This set up also works well in windy conditions.The best features of the reel is rear drag system and cast trigger."